Do you own a property in Paris or Amboise and are looking for reputable management/rental services ? My France Vacation Rentals, is the name of our boutique style, French Town & Country, vacation rental service. We are two Francophiles, who have been managing vacation rentals in Paris and the Loire Valley/Amboise since 2003. 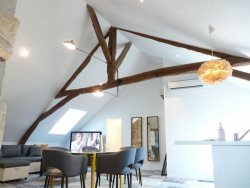 We take care that each rental be unique, more than just a place to sleep, we offer a genuine hit of real life in France without sacrificing comfort for charm, and we take pride in doling out plenty of both ! Our personalized approach to matching each of our authentic French lodgings to best fit our guests' needs, and our mission to assure memorable France Holidays for our guests from start to finish, also reflects our approach to managing our owners' properties. Since each owner, and each property is unique, we offer full - or - customized management ! My France Vacation Rentals Team !